The first thing that I thought would give it away was the amount of protein. I can remember someone at a gym that I went to (10 years ago) telling me that I needed to eat more protein, and she recommended Special K with Almonds. 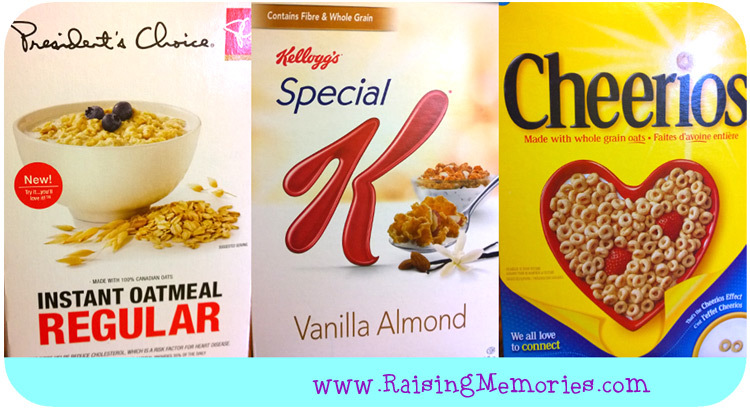 So, remembering that, I thought that Special K would be the cereal with the most protein. I was very surprised to see that it actually had the lowest amount between these three! I was also surprised to see how much sugar is in the Special K (but then I remembered I was comparing with plain Cheerios and plain Oatmeal, so I wasn't too surprised... but then I looked at the Alphabits in the cupboard and they've only got 2 more grams than the Special K!). 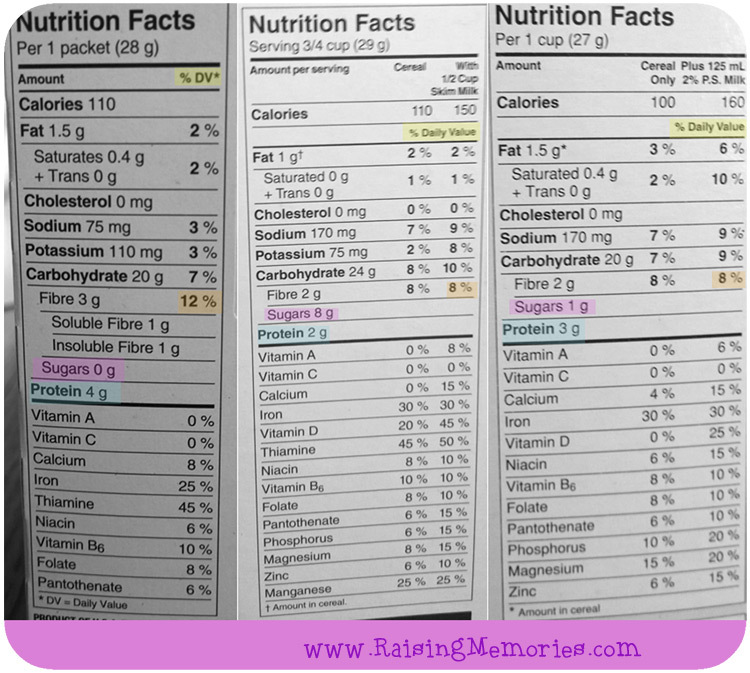 If you go to the Nutrition Facts website, you'll see that they recommend that you start by looking at the serving size (because it's not always the same amount that you would eat) and then take a look at the % daily value (sometimes shown as %DV). If you are trying to get more fibre, for example, you'll see that between these three, the oatmeal would be your best bet because its %DV is highest. The website suggests that a % lower than 5 is low and a % higher than 15 is high. You can take a little quiz on the Focus on the Facts website, and enter a contest to win a $300 grocery gift card! Disclosure: This post was a sponsored post. The opinions are completely my own. Sobeys would be great! Thanks! If I win a Costco card would be nice or Loblaws. That's so interesting! I was surprised, too, one time when I looked at the amount of sugar in a cereal I considered "healthy" with one of those "kid-sugary" cereals. Of course, all sugar isn't created equal, but I'm pretty sure they had the same kind of sugar in them. Good to know what's in your food and if it's nutritious or not. I would choose a gift card to Walmart. I would love to have the Walmart gift card. I would love a gift card to superstore (so I guess Loblaws). Thanks for the chance! I would choose costco if i won! I would choose Walmart :) Thanks for the chance! I would choose Walmart for my GC. I'd like to get a gift card to Costco. probably walmart would be best! Thanks for the info, I would have guessed the cereal with almonds to have the highest protein as well! I would like it to Loblaws. I would choose a Gift Card to Walmart if I was the lucky winner. They have such good sales. I would want a gift card to Walmart. I would choose the walmart card,thanks for the chance! I'd go for the Costco gift card. I love shopping there. Loblaws for me please. I shop mostly at Food Basics but I don't think they take Metro GCs. I would choose Walmart if I was the winner. I would choose a card for Metro, one of my favourite grocery stores. I would probably choose the Wal-Mart gift card. I would choose a Walmart card! I nearly always buy PC products. They are the best. I would choose Walmart card, thanks for the chance! I would choose Walmart since you can use it for groceries and other stuff. I would like a gift card for Sobeys - thanks! If I won, I'd like a Loblaw's gift card! I would love a Federated Co op GC if I won - love the Co op! So many places I shopped at - Walmart, Costco or Loblaws for me! I would choose a gift card for Overwaitea. Thanks for the giveaway. If I won I would choose a gift card to Sobeys. I would love a Walmart gift card for groceries. Thank you! I'd love a Walmart gift card!! We've been doing a surprising amount of our grocery shopping there. Loblaw's i believe they own Superstore. If I won, I would love a Sobeys gift card! I would probably choose Sobey's or Costco. I would love a Wal-Mart gift card please - but with the cost of groceries now, any gift card would be so appreciated. Walmart or ShopRite would be great!! Thanx for the chance. To be honest, I never read labels before I was diagnosed with Celiac Disease. Unfortunately, I live by them! I normally look out of gluten products, but I have started reading nutritional value as well! I would pick Sobeys if I won. Thanks for the chance. I'd love Walmart. Thank you! OMG , jumping Jupiter, I choose Loblaws gc. Wow, prize $100 gc is fab. & splendid. 2 fingers snap. It is tight, fly & off the chain. Thank you for the awesomeness, the contest, and generosity. :) Pick me, pick me! Dear Santa: I’ve been nice. My X-Mas wish this year is to win this contest. Starving artist here desperately needs the gc to shop and eat. A life changing exp. I love that you've turned learning about nutrition into a game; one that I would lose I might add but at least I'd finally learn how to read the facts. I would love Costco. That's my favourite store to get the good things like fruit and crackers. Well I love Sobeys because it s close to my house and we visit there at least weekly. It's my main grocery store. But I need some things at Walmart too so that would work also. I didn't think about the oatmeal at all previously but I do know that Cheerios are great and low in sugar. We eat them daily. I would pick the Walmart gift card please! I would choose either Freshco or No Frills. Both stores price match and with No Frills I can earn PC Points. I would pick Loblaws! thanks for the chance! I would use a card for Freshco or Sobeys. Sobey's would be my pick! I would choose a Sobeys Gift Card. I would like a Metro card. I would want a Walmart or Loblaws gift card. The Loblaws gift card please. I would select Walmart Who am I kidding I would be happy with any of them. Thanks for the chance. I would choose Walmart because I've really been impressed by their selection of meat & baked goods! I would choose Walmart or costco :) thanks for the chance! a lot of shopping there and love their products and specials. If I win I would pick Walmart as it's the only option near me. If I won, I would choose Walmart. Thank you for the giveaway! I would love a gift card to Walmarts. This would be very helpful to my budget and I shop there often. I would love a Costco card if I win. I do so much shopping there! i would like walmart and thanks so much for the chances to win. I'd love a gift card to Loblaws - it's where we shop most! If I'm lucky enough to win, I would like a Walmart gift card. I would choose Loblaws gift card!